Pit stains are one of the most annoying side effects of underarm sweat. They cost you time, money and frustration. But what causes pit stains and can you avoid them? In previous posts, we've covered the science behind pit stains, how to remove them, and how to prevent them. In this post, we answer: What causes pit stains? and offer tips to keep your shirts looking new. Here are the major causes of pit stains — and ways to avoid them. The type of sweat you produce also affects yellow stains. Sweating under stress (like during a presentation or interview) produces a milky, potent combination that fuels pit stains. Aluminum in antiperspirant is a primary culprit behind pit stains. When underarm sweat, skin bacteria and antiperspirant react, ugly yellow pit stains form. To help reduce yellow marks, choose deodorant over antiperspirant. Read: The Best Natural Deodorants for Heavy Underarm Sweating. Although deodorants don't contain aluminum, over-applying can also cause staining. Instead of layering on swaths of deodorant, apply less — just more frequently. Allow plenty of time for your armpits to dry before getting dressed so deodorant residue doesn't end up on your shirt. If you can't forgo antiperspirant, apply it before bed so it can better absorb into your skin. Whatever you do, don't make the mistake of adding bleach to you your shirts or hanging them to dry in the bright sun. While bleach is an effective stain remover for some fabrics, it actually worsens your pit stains on materials like spandex, wool, silk, leather, mohair (goat hair) or blends of these. So you're probably thinking: Who has time to read every shirt label before washing? That's why it's best to avoid bleach altogether, especially if you sweat heavily. Resisting the urge to bleach your white button-downs is hard. If you can't let go, check out this complete list of bleach-resistant fabrics on Clorox’s Dr. Laundry webpage. This will help you know what you can and can’t bleach. Sunlight also has bleaching properties. If you're prone to pit stains, don't dry your shirts in the sun. Instead, hang them on a drying rack in a dark, dry place like your garage. The last thing you want to do after a long day of work is laundry. So you probably toss your sweaty clothes into the hamper until your designated laundry day. But letting sweaty shirts bask in the hamper for weeks is a recipe for pit stains. Waiting to wash your shirts allows the stains to set. Adding heat from the washing machine and dryer only makes yellow stains more difficult to remove. Avoid pit stains by pretreating your clothes with Raise immediately after sweating in them. If possible, don't wait too long to wash your sweaty shirts. Any idle time in the hamper (or for some of you, the bedroom floor) will only worsen pit stains. Read: How to Remove Pit Stains On Dress Shirts. Many consumer reports say OxiClean is a great stain removal option — when used correctly. You might have tried OxiClean with no success — but there are two ways to attack pit stains with OxiClean, depending on the severity of the stain. Immediately after removing your sweat-soaked shirt, add a few spoonfuls of OxiClean to the washing machine. Be sure to use the warm setting for white shirts for improve brightness. If your pit stain situation is serious, you’ll need to get more aggressive: a large bucket, HOT water and OxiClean. Add hot water and a scoop or two of OxiClean to the bucket. Mix the solution around, and let it sit for a few minutes before adding your stained shirts. Soak those babies for an hour at least (or more for tougher stains) and get ready to use some elbow grease. Once the shirts have soaked for a while, grab a laundry brush and more OxiClean. While the shirts are submerged, pat powder onto the stains and scrub away. Routinely pretreating pit stains will save you time. But if you must use the scrubbing method, OxiClean will make your shirt look as good as new. 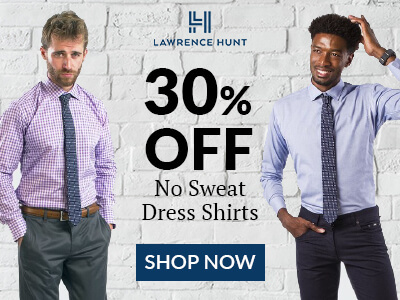 If pit stains penetrate your undershirt and your dress shirt, you need to rethink your Hanes. Instead, choose an undershirt that actually blocks pit sweat. Thompson Tee sweat proof undershirts completely absorbs underarm sweat and allow it to evaporate — so sweat never reaches your outer shirt. That means no sweat marks or yellow stains. Period. Try one risk-free today. Do you deal with pesky pit stains? We'd love to hear your tips in the comments below!